Not that I actually went to Rhinebeck. Anne was nice enough to do some shopping for me via texts and with some help from Cookie. 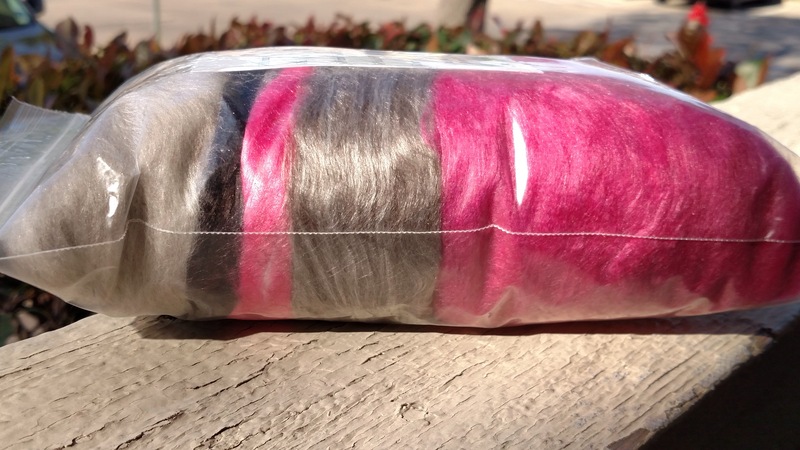 I’ve been coveting Into the Whirled batts for a while and this year, the stars aligned. I was doing this local dye day thing instead. I only have two things to say about it. 1) Stop touching my yarn! and 2) Shut up! Shut up! Shut up! I KNOW how to dye yarn. Maybe I do have a little more to say. 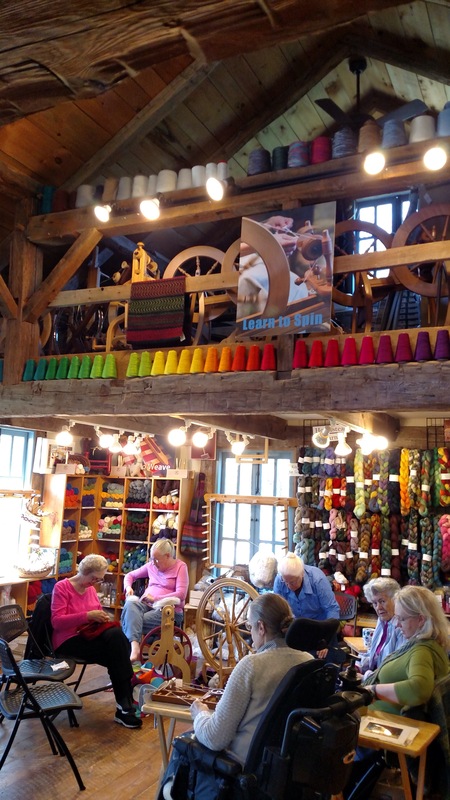 Most of the ladies were nice and the hostess has an amazing collection of fiber tools. 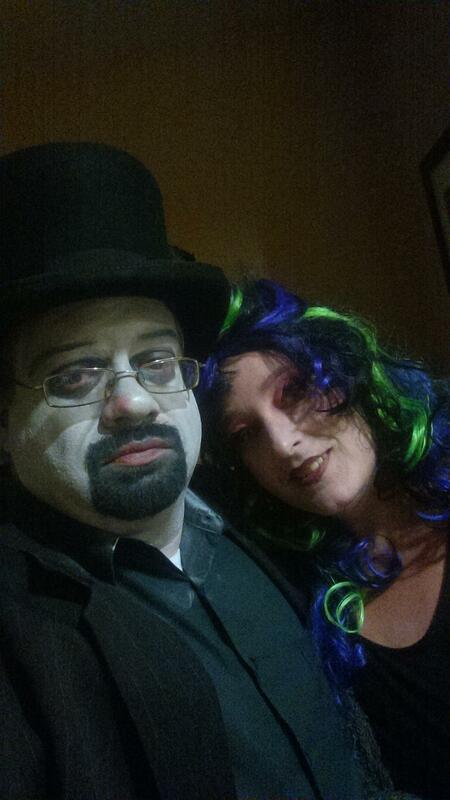 Also, my husband geek bonded with the hostess’ husband. What? You think I was going in alone? Hells no! Then there was gay Halloween. Not as fun as last year because someone had a crappy attitude, but it still had it’s moments. Please do not pass out. I left them as singles (because what the hell would I knit with half of that?) and tried a new blocking method. You leave you singles or over-twist yarns on the noddy noddy and steam iron it. Move it, iron it… etc. If I had more patience, I’m sure it would have worked nicely. I have a tall iron, so I could only do little sections. About the 3rd time I had to shift the yarn, I called it good. You can definitely tell where it was ironed and not. I’ll wet finish it later. It’s hot. Hot enough that I’m not excited about the tournament this weekend. Hot enough that I’m thinking of leaving my husband and showing up on Angie’s doorstep for the summer. I may have mentioned to Texas that I was moving back to the lake house until October (it’s about 15 degrees cooler there) and he was o.k. with it. I figure 2.5 hours to the lake vs. 15 hours or so to Wisconsin… that’s about the same difference, right? 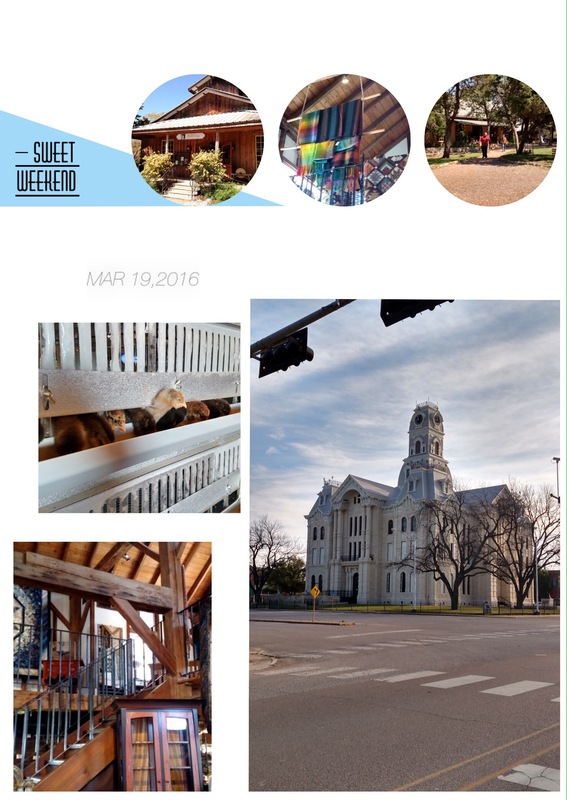 Besides, Angie has a creek, a new loom, a fiber room and precious kitties. You don’t think she’ll mind, do you? Not by me of course. I fell in love with all the snowboarding stuff during the Olympics. I had no idea either. I will probably now become an X-Games watcher. Y’all might want to start planning that intervention now. Nook-Kabbalah for Beginners by Rav Michael Laitman, PhD. Sights: The mylar balloon that just won’t deflate! Current Knitting: The sweater that just won’t end! Current Spinning: Spinning? Who spins? Current Weaving: Um, yeah, I saw a couple of loom things around here somewhere. Author stacey919Posted on March 4, 2014 Categories UncategorizedTags Knitting, Spinning, TMI, Weave4 Comments on There was snowboarding! Reading . . . Plowing with Pigs. Umm, yeah. Crazy, party all the time, CA girl is all up in this farming schtuff. My nook library has gone from all leisure, all the time to farming and educational titles. I may have to remedy that. Knitting . . . socks. Been on the needle for almost a year and not even done with the first one, socks. Spinning. . . I have a wheel? Or a spindle? Reeeeealy. Listening to. . . Merry Go ‘Round by Kacey Musgraves. Local (ish) girl done good. Plus who can resist an album named “Same trailer, different park”? Thinking about . . . fencing. More and more and more fencing. ALL the fencing. Dreading . . . making Cheddar a steer. Planning . . . my next idea of course. Trying to figure out if I’ll be needing the bail fund. Excited about . . . going to the lake this week! Drinking . . . coffee. Itching to . . . cast on with some yarn I just dyed. Organizing . . . his tools. So the back room can become a room again and not a gathering place for wood and tools and hardware. Happy Thursday y’all! What are you doing on the fine Pre-Friday? First time spinning bamboo. We had a little learning curve. 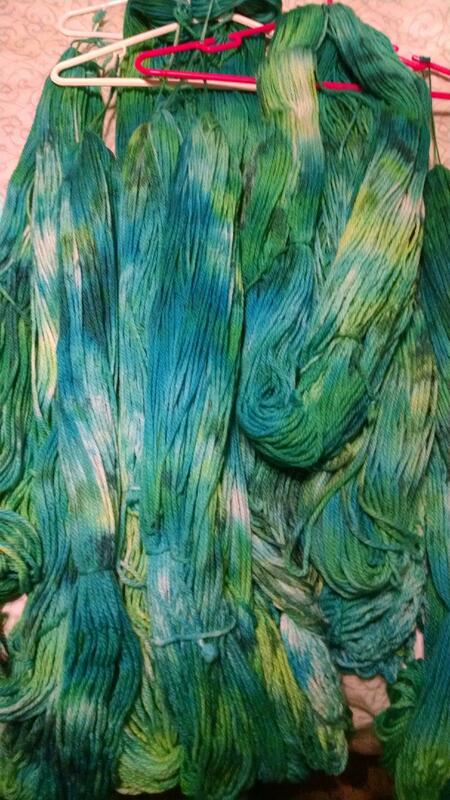 O.o It was way over spun and way over plied. Yeah, and ignore the poorly lit, crappy cell phone picture. The stuff also bled blue all over when I soaked and thwacked. I don’t know if it will be blue and tan when it dries. 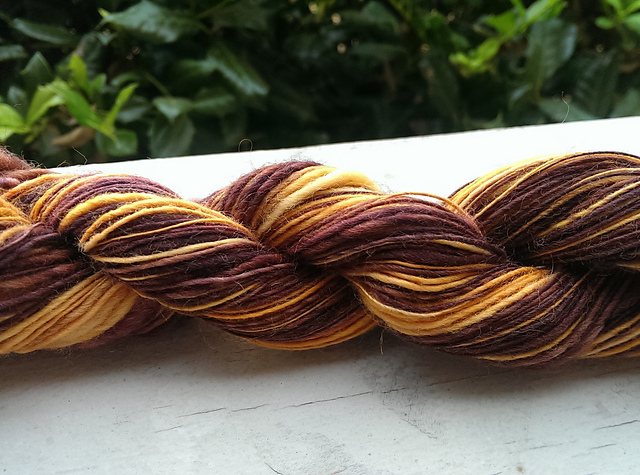 It was a really pretty color when I finished spinning. I’m still hanging on the couch, in the a/c, watching season 6 of the Shield, sucking down pills. There are still 36 days left. Luckily I have the complete Nip and Tuck to keep me busy. I have some Spunky or some Woolen Rabbit that I’m thinking of spinning next. Apparently there are people suggesting I should knit a tractor cozy. Even I am not that crazy. I think. I like spinning batts and the mistress of cupcakes may be getting plenty of orders in the future. Should I knit a tractor cozy? *that song is still there. Anyone? 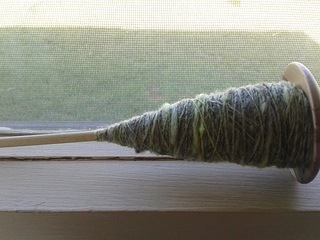 I spun during the Tour de Fleece. I know. Don’t drop over. I’ve joined every year, but this is the first time I actually did something. 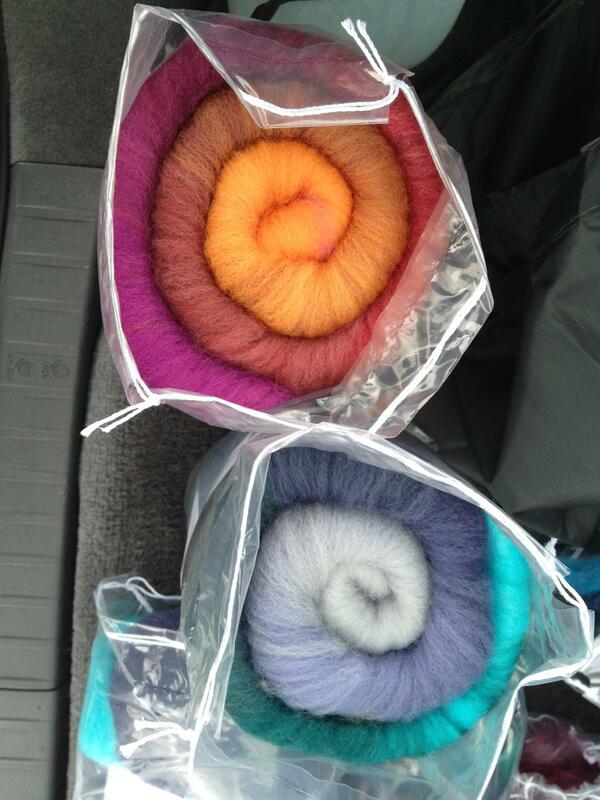 I bought the batts at the 2009 WI Sheep and Wool with Angie. 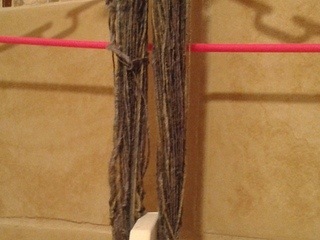 I spun the Romney/Rambouillet on my spindle and the plain Rambouillet on my wheel. Both were 1 oz batts. 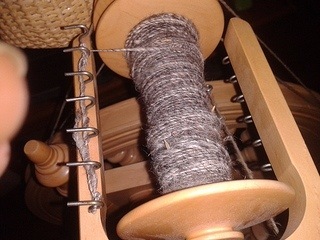 I spun thicker and more consistent on my wheel and after plying both together, I had 3 inches shy of the same yardage left over of the spindle. I finished a sock too. My second of my personal “need socks now campaign”. Yes, I’m knitting one sock of each pair at a time. I figure that should keep me interested and I should finish at least one of the pairs by the end of the year. Hey! You! Stop that snorting and giggling. We’re getting a brush hog for our tractor this weekend. Oh yeah! I can play on the tractor. I don’t think that we’ll be getting the goat pen built. However, the goose pen will be. The big male goose thinks that everything moving (and not) is his to do with what he wants. Adolescent males. What can you say? Should I knit a tank top? *Random song lyric stuck in my head. Do you know what it is?